Easily present and serve everybody’s favorite spices, salts, chili powders or anything else with Southern Homeware’s 3 Compartment Seasoning Box. This simple and effective spice pot is just as perfect for the home table as it is for restaurants, barbeques, camping, and diners. We’ve included the spoons and lid to give you easy serving and protection from dust, along with years of sturdy, break-free service. Serve, present, and garnish with Southern Homeware’s 3 Compartment Durable Plastic Seasoning Box. This simple and effective acrylic spice pot gives you the perfect way to present a host of spices on your table, with a break-free guarantee and plenty of room for your favorites. Load it up with gourmet salts, chilli peppers, italian seasoning or other time honored spice blends that you know your family and patrons love, and let them serve to their heart’s content! 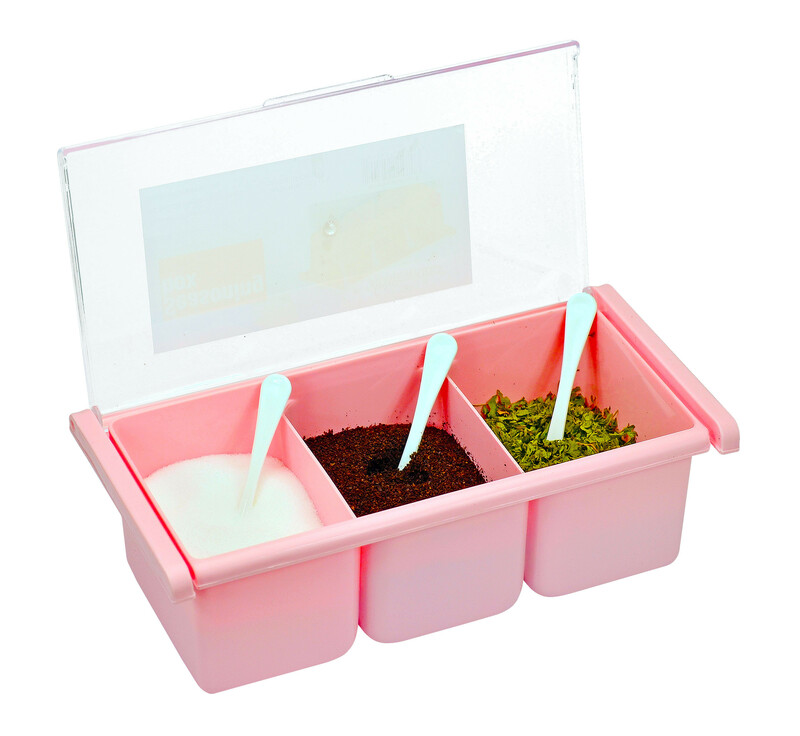 With an included spoon for each compartment and a lock-down lid, this simple spice storage container gets the job done and looks great doing it in a lovely shade of pink. A perfect, durable solution for camping, restaurants, diners, church dinners, outdoor events, and more! You can order one for every table and give your guests the garnishes they need to make your meals shine, with little fuss. Fully dishwasher safe, you can simply add these units to your normal cleanup routine, without messing around with complicated glass salt cellars or overly showy designs, and simply get what you need. Order yours today, and enjoy a decades-long solution to tasty meals! Color is Pink. Includes one seasoning box. Compartment inner dimensions measure 2.78 inches wide, 3.75 inches long and 2.57 inches tall. Overall unit size is 9.5 inches x 4.9 inches x 3.05 inches.